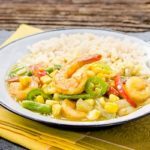 Thai Yellow Curry Shrimp is healthy comfort food. It is bursting with flavor, loaded with shrimp and vegetables, plus quick and easy to make. Heat oil in a large skillet over medium heat. Add onion and cook until soft and translucent, about 5 minutes. Add garlic and curry powder, stir, and cook for 2 minutes. Whisk in coconut milk, fish sauce, and brown sugar. Bring to a low boil and cook for 5 minutes. Add shrimp and vegetables. Stir and cook until shrimp are just cooked through and vegetables are crisp-tender, about 3 minutes.